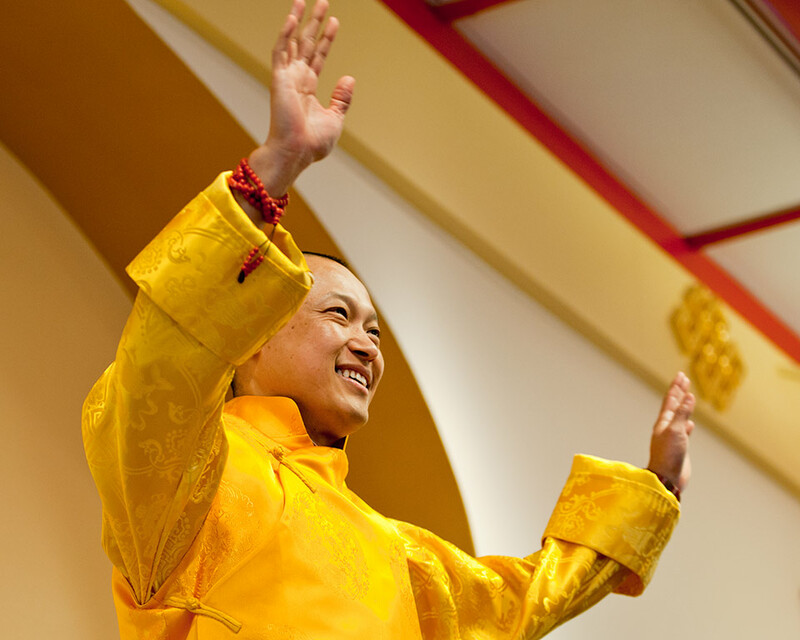 Sakyong Mipham Rinpoche Greets a Cheering Crowd on Shambhala Day. Photo courtesy of Marv Ross. May the dawn of basic goodness arise. May the confidence of goodness be eternal. May that goodness bring profound, brilliant glory. I am back! [Applause and cheering] I’m rested, and I’m ready to go. And I love you all. Thank you, that’s it. On the one hand, we thought he was being grandiose, but over this last period, as Lady Diana has mentioned so eloquently, the students really mean it, whether we are ready or not. We have had a layering process of students—as we can hear and see—and now we have a real community, a society. Part of this message of spirituality is that we can no longer split spirituality and everyday life, and that we all possess the ability to live a unified life. We have the ability to be awake and to live up to our potential. The message that I want to express today is that unless we as Shambhalians acknowledge basic goodness—even though this is not a level one talk today—the reality is that unless we recognize this, we have no future. It is us actually having confidence and bravery in the most inner level of who we are. To be dramatic, we are at a critical point. In some ways, it is very black and white. If humanity does not look inner and feel their basic goodness, then the future is very bleak indeed. Out of that insecurity and deep-seated feeling of guilt or whatever, people do horrendous things. The notion of basic goodness is that we are intact; we are whole; we never, as the Dorje Dradül liked to say, made a mistake. When we get up in the morning, we don’t have to feel like we have to make up for that mistake. On the one hand, this is very simple, but if we self-reflect, we realize how much of our life is an unfolding of how we feel about ourselves, or a lack of it. And now at this point it is a global phenomenon: we have entire cultures completely unsure about their own humanity. The Dorje Dradül was looking at the most profound teachings that he received. He said that unless this is transmitted, the basic core of who we are as humans and as beings on this planet—unless we feel confident in that—then the literal future of what this planet could be is in peril. A lot of us did not necessarily sign up for a global initiative. I can partly say, “Me too!” but karmically I must have chosen it. But that’s what it is, the hidden joke that the Dorje Dradül left us. We all came into this shrine room thinking that this was about “me,” but the big switcheroo is that it is about “you”—it’s about the world. It was interesting being in retreat because there are many profound practices that I had the honor of participating in, but it’s all window dressing unless we recognize this basic goodness. From a mahayana point of view, if you want to call it changchup sem or bodhichitta, from the Great Perfection, you can call it rangjung rikpe yeshe, innate wisdom. But those are technical terms. The Dorje Dradül called it “basic goodness.” As a little gift to me, could you say those words? Basic goodness. [All say it.] Doesn’t it feel good? Let’s keep it simple. If we can all wake up in the morning and feel that—especially this group, we are very intelligent, sometimes to a . . . you can fill in the blank. You know, even when there are profound transmissions, in the back of our minds we are saying, “Wait a minute.” We can’t just relax. This is about us relaxing with our human nature. It is inevitable that emotions come up, and we should never feel bad about that, but there has to be a basic underlying communication—that this is what our initiative is. This is building enlightened society. People ask me what mantras I am doing on retreat. They’re always trying to figure out the secret. And I tell them I am actually working on a conundrum—it is called enlightened society. It sounds like an oxymoron. Many times when we have committee meetings, the IQ level goes way down—we can’t make even simple decisions. Society somehow brings out the worst. But the notion of enlightened society is that there is an underlying feeling that humanity is good. On the one hand, there is nothing to be lost by that. You can call it confidence, as the Dorje Dradül said—you can call it trust, you can call it faith, or clarity—but there is this part of our mind which is a living breathing thing that wants to know. This journey has gone from a personal journey to a societal journey for us. What we hold in our hands—the threshold—is the Shambhala teachings. It is up to us now to manifest it. Part of the notion of enlightened society is that we will have to embody; we will have to live. For myself, having a child and having a wife, being a family, and having all of you as family, it is a very choiceless situation, in a good way. You can’t really hide—as those of you who are married, or near married, know. It is a path of surrounding. Many of us in some ways love the community, and at the same time we can’t wait to get away from it. But it is really a notion of when we are ready to jump in and when we are willing to go deep. All of those who are listening to me around our wonderful Shambhala world, I feel your hard work and commitment, and I feel that there is this longing. This came out in the recent Letter of the Morning Sun—I spent all night reading all those emails. Not exactly, but we had several thousand, and many people said that the dog ate their homework and they would like three more months. I said that is fine: those of you who would like to spend more time contemplating and writing further responses, I welcome it. This has been an incredibly important expression for myself and response from the community. Looking at what people have written, I see there is a world of different lives going on—there’s a lot of joy, a lot of suffering going on, there’s a lot of questioning, a lot of enthusiasm, but I think one thing we don’t want to do is fall into being careless, lazy, not caring. We want to engage. One of the main things that came out from all these letters is that people want vision and purpose for living. As human beings, we need that purpose. We need that wake-up. So I encourage everyone to please continue writing and responding. It is a wonderful way of reflecting. I am extremely happy that the Kalapa Council and leadership have not stopped while I was on retreat. And during this year with the birth of Jetsun Drukmo and the Sakyong Wangmo being an excellent mother, if I may say so—being both patient and playful—it’s been a real joy. Coming from a dharmic family, she allowed me to complete my retreat, which I deeply appreciate. It has been incredibly important for my personal journey. Part of this was that I needed to stop; I didn’t really want to keep going if it was just going to be going through the motions. On a heart level, I wanted to know where you’re at. I do feel like more than ever, that if we connect at all the various skill levels, all over the world, as Shambhalians, we will have an effect. One thing that’s interesting for myself is that somebody is going to make the decision—there’s somebody. If we let negativity rise up, then we will have a generation of people who will feel deprived. So Shambhala is about the notion of what we have. When people recognize their basic goodness, they become more generous. When the basic nature of the mind is not recognized, we become materialists, and consume. We will ravage our planet—both emotionally and physically. Shambhala has really gone from being a dalliance—if it was ever one—to how we live our life. Having just come from Asia, the fragility of these teachings is even more apparent to me. So I encourage all of you to layer and absorb your mind with the profound teachings of awakenment daily. It is very easy to forget view and purpose. So let us continue the practice and let us continue in this together. It seems like an impossible mission in that there have been fragments of enlightened society—some people got the first part right or the middle part right—but the whole thing didn’t happen. So we are actually doing something that may never have been done before. So from that point of view, it seems impossible. As he liked to say, the more you look at the possibility of impossible, the more possible it is. So that is what we do. We are in the profession of making the impossible possible. We could just sit back and say, “It’s impossible.” But with just a little bit of white-out, we can take the “im” away. That is our duty and delight. What is a Shambhalian? We have good days and bad days, but we are delightful people, by the way. Right? Where does the delight come from? Delight comes from having a sense of purpose. So I hope our community has a sense of purpose, and I feel like we do, very much. We are on the threshold of this generation. Therefore I offer what life I have left for the further establishment of the Shambhala lineage. With this good-heartedness, many beings will be born in our community and around the world who will take this to heart. It’ll all come down to one person being brave and believing in basic goodness, and doing something. They will inspire others, which will have a chain reaction—whether it’s in a family, in a business, in social work, in politics. What we have to do is have a community where that is acknowledged as being good, as opposed to that it’s a joke. It is very easy to play the game of sarcasm, but can we actually hold our ground? I love you, thank you, and this year—all of you around the world—I look forward to all of the programs and gatherings continuing. I almost hate to say “programs,” so I would like to say gatherings and trainings, deepening and educating. I encourage all of you, whether you are young, medium, or extra- medium, to continue being educated. On this particular day, I invoke the memory and heart and warriorship of the Dorje Dradül, the Vidyadhara the Venerable Chögyam Trungpa Rinpoche. I feel his love and blessings here, and his grandchildren, and so forth. I appreciate being here in Boulder where people have been practicing and establishing this vision for a long time, and I appreciate this incredible transformation that has occurred. To all of you in the various time zones around the world, I send heartfelt love and blessings—so tashi deleg, gut morgen, bonjour to everyone. The Shambhala Times received this link to a video of Shambhala Day in New York. Enjoy!